[CONTINENTAL CONGRESS]. Newspaper. 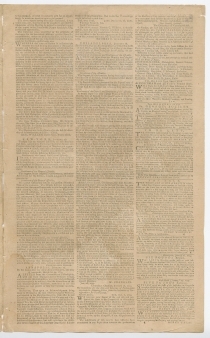 The Pennsylvania Gazette, January 18, 1775 (No. 2404). Philadelphia: David Hall and William Sellers. 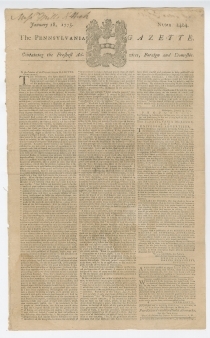 “Petition of the Continental Congress To the King’s Most Excellent Majesty” (October 25, 1774). 4 pp., 10 x 16¼ in. Many members of the Continental Congress blamed the crisis between Great Britain and the North American colonies on acts of British governors, military officers, and ministers. On October 1, 1774, Congress resolved unanimously to prepare an address to the King, and appointed Chairman Richard Henry Lee, John Adams of Massachusetts, Thomas Johnson of Maryland, Patrick Henry of Virginia, and John Rutledge of South Carolina as a committee to draft the petition. On October 3, 4, and 5, Congress deliberated on the proper matters to include in the Petition, and Patrick Henry wrote a first draft. On October 21, Congress debated the first draft, asked for revisions, and added John Dickinson of Pennsylvania to the drafting committee. Dickinson wrote a second draft that was much closer to the final form. The committee reported Dickinson’s draft on October 24, and on October 25, Congress debated it by paragraphs, amended it, and approved it. Henry Middleton, the President of Congress, and fifty delegates representing twelve colonies (Georgia did not participate) signed the address. As colonists loyal to the British monarch, they pleaded with King George III to intercede with Parliament to preserve English liberties in the American colonies, specifically requesting repeal of the Intolerable Acts, passed by Parliament earlier in 1774. The petition arrived in London on November 14 but was not presented to Parliament until mid-January 1775. When the official papers of Congress were published in October and November 1774, Congress omitted this petition, feeling that the King should read it before it was made public. Neither King George III nor Parliament replied. Not until January 17 or 18, 1775, did Charles Thomson, secretary of Congress, release it for publication, and it immediately appeared in the Pennsylvania Gazette issue offered here. “We your Majesty’s faithful subjects...beg leave to lay our grievances before the throne. “A standing army has been kept in these colonies ever since the conclusion of the late war, without the consent of our assemblies; and this army, with a considerable naval armament, has been employed to enforce the collection of taxes. “The authority of the Commander in Chief, and, under him, of the Brigadiers General, has, in time of peace been rendered supreme in all the civil governments in America. “The Commander in Chief of all your Majesty’s forces in North-America has, in time of peace, been appointed Governor of a colony. “The charges of usual offices have been greatly encreased, and new, expensive, and oppressive offices have been multiplied. “The Judges of Admiralty and Vice-Admiralty Courts are impowered to receive their salaries and fees from the effects condemned by themselves. “The Officers of the Customs are impowered to break open and enter houses, without the authority of any Civil Magistrate, founded on legal information. Three drafts of the Petition survive. Patrick Henry’s draft contains more rhetorical descriptions of the contested Acts and focuses less on the Colonies’ past loyalty to Britain. Its four folio pages show very few corrections. The Richard Henry Lee draft includes only brief descriptions of the grievances but makes a harsh attack on the King’s ministers, most notably Bute, Mansfield, and North. This three-page version may have been the one rejected by Congress on October 21. 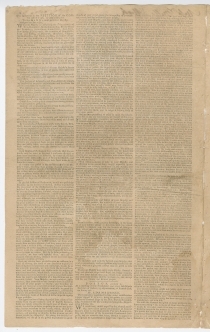 The John Dickinson draft, nine and a half folio pages, exhibits many edits, including entire transposed paragraphs. It is virtually identical to the document adopted by Congress, except that the list of grievances in the adopted version more resembles those in the other two drafts. 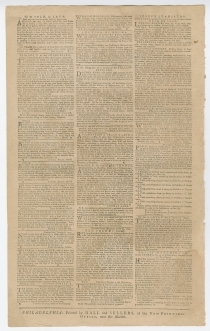 This issue of the Pennsylvania Gazette also includes a lengthy front-page letter from “An Anxious By-Stander” with “a watchful bosom, which throbs with painful anxiety for its country’s welfare” (p1/c1-3); a report of and resolutions from a meeting at Faneuil Hall in Boston regarding a letter by General Thomas Gage (p2/c2-p3/c1); revolutionary news from New York and Maryland (p3/c1-2); the report of a speech by Governor William Franklin to the General Assembly of New Jersey (p3/c2); the announcement of a series of lectures on chemistry by Dr. Benjamin Rush (p4/c2); and a series of advertisements and announcements, including the detention of an Irish servant girl named Sally Boyd in the “goal” (jail) at Reading, whose master was requested to retrieve her or she would be sold (p4/c1).